Any purchase of 3D letters and dimensional letters comes with a lifetime manufacturers warranty. Our manufacturers stand behind their products so we can too! 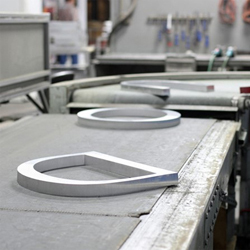 3D letters and dimensional letters are produced using start of the art machining. There are no cut marks on the edges, colors are consistent throughout to match your brand identity, there are no rough edges, and where appropriate all edges are sharp because your 3D letters are either laser cut or water jet cut. With a lifetime manufacturers warranty you know you are receiving the highest quality letter made in the signage industry. The 3D letters and dimensional letters that we sell are made from many professional materials guaranteeing longevity and long-lasting beauty. Whether you're using these dimensional letters for outdoor business signs or as wall letters to enhance your foyer or business entrance we sell metal letters, acrylic letters, laminated acrylic letters, cast metal letters, vacuum formed plastic letters and more. All made to exacting specifications and they can be painted any color or sheen. All of the dimensional letters that we sell look great on walls, business signs, building exteriors, and more - it really depends on your objectives and the type of look you are trying to achieve. For some, our solid metal letters are the cat's meow while for others we can achieve a solid metal look with cast metal letters and even laminated metal on acrlyic. Others are looking for budget 3D letters and we have those also. There's the CAB plastic 3D letters and acrylic dimensional letters. We can create logos from many of these materials. When considering price then thickness is also a consideration when choosing dimensional or 3D letters. Thickness is limited to the materials you choose. Assuming the same thickness here you have dimensional letters by price. These letters are made from high grade plate metal. Metals available include prime Aluminum, Stainless Steel, Bronze, Brass, Copper, Core-Ten® steel. Our collection of choices, finishes and gauges so you have more choices and delivery is fast - approximately 7- days from design approval. These dimensional letters are hand finished and manufactured tested for quality assurance and to last a lifetime or they are replaced for FREE! To maintain true quality standards our manufacturers operate several of their own bronze and aluminum casting foundries. These dimensional letters have long been favored by Banks, government buildings and universities for their classic look and deep dimension and durability. They are hand-finished from cast aluminum or bronze. These letters can be designed using a large variety of font styles, profiles, and finishing options, with the flexibility to be customized for your needs. These dimensional letters are manufactured in all-electric, pollution-free furnaces and are made from earth-friendly alloys free of lead and mercury. Production time for these letters usually runs about 8-12 days to delivery. Each cast metal letter is finished to your specifications and tested for quality assurance. They will last a lifetime or be replaced FREE! These are stainless steel and aluminum letters with a wide variety of finishing options. Choose from brushed, polished, titanium coated, or painted finishes. For aluminum 3D letters there's all the finishing options of the stainless steel letters plus aluminum can be annodized. Anodizing is an electrochemical process that converts the metal surface of aluminum into a decorative, durable, corrosion-resistant, anodic oxide finish. Aluminum is ideally suited to anodizing. These 3D letters are crafted in the USA for speedy production times and are shipped within 12 days. Fabricated metal letters arrive at your door witha lifetime manufacturer's guarantee replacing them for FREE if they ever fail in the field. When it comes to wall letters these are one of the most popular choices. You're getting more than an acrylic letter. These letters are extruded in-house by our manufacturer maintaining quality and consistency and are formulated with an impact modifier (unlike typical acrylic dimensional letters) so that they stand up to the toughest application challenges only found within the sign industry. And our acrylic letters and logos can be customized to virtually any custom graphic design, with laser-cut polished edges that are smoother and sharper and can't be duplicated with a traditional router. These dimensional letters are available in many standard pigmented colors or painted to your specifications, we have the widest offering of plastic pigments and thicknesses because these letters start as a sheet of impact-modified acrylic extruded at our manufacturer's plant. Because these letters are made in the USA we can have them shipped to you within 4-days, from a regional facility near you. Oh! Did we mention the lifetime manufacturer's warranty? These Cellulose Acetate Butyrate (CAB) formed plastic letters and logos are tough, weather-resistant, earth-friendly, and cost-effective. These letters are used by many small businesses and you may have even noticed them around town. These letters are also popular for business signs and wall signs. This is by far our most popular and cost-effective option because it gives our clients the variety acrylic, metal and foil laminates on impact-modified acrylic or high density foam substrates, in multiple gauges that balance affordability with beauty. These dimensional letters are made from the same extruded impact-modified acrylic sheet as are all of the acrylic letters and the foam is a thick high-density foam made in-house by our manufacturer so that quality is controlled and we can offer more variety in colors and thicknesses than other sign companies. And yes! These dimensional 3D letters come with the same guaranty as all the other dimensional 3D letters we sell. Made in the USA there is typically a 5 day lead time from the approval of your design. Selections that guarantee longevity and long-lasting beauty. Whether you're using these dimensional letters for outdoor business signs or as wall letters to enhance your foyer or business entrance we sell metal letters, acrylic letters, laminated acrylic letters, cast metal letters, vacuum formed plastic letters and more. All made to exacting specifications and they can be painted any color or sheen.